Here are the Classes that I will be teaching this Winter/Spring session at Joggles.com. This 4 lesson class is scheduled to begin on January 18, 2011. 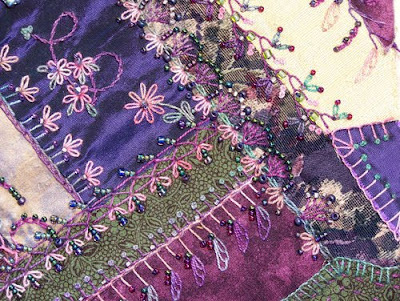 This is a great introductory class to traditional embroidery stitches with the added flare and dazzle that only seed beads can add. 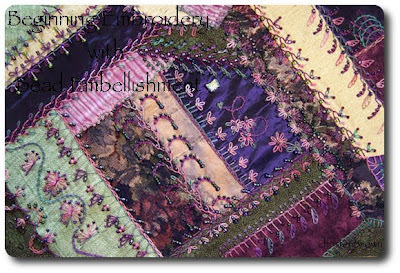 These stitches can be incorporated in any fiber design that you choose, whether it be an already stitched crazy quilted block, a strip pieced pillow top, or an appliquéd art quilt block. A variety of stitches are used in each separate embroidered design, a Base Stitch, a Design Stitch, and an Embellished Stitch. Additional embellishments will also be covered such as adding in buttons, sequins, large beads and charms. This 3 lesson class is scheduled to begin on January 28, 2011. 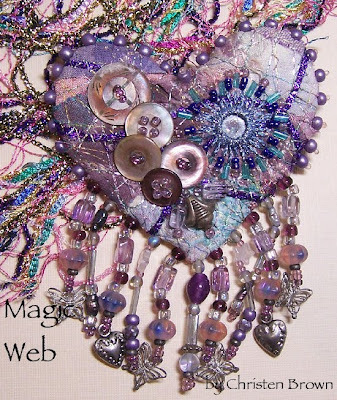 Do you have a wonderful stash of buttons and beads that are just waiting for the right project to come along? Well consider these beaded and buttoned up bracelets, which are made using two different Right Angle Weave techniques. The first bracelet simple and elegant the other feminine and charming; both take only a short amount of time to make. This 5 lesson class is scheduled to begin on February 25, 2011. 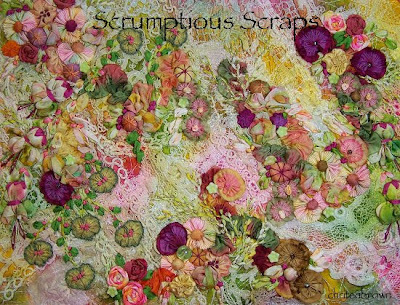 Scrumptious bit and pieces of vintage laces are melded and stitched together to form a unique and beautiful base for your creative stitched designs. Once the lace scraps are turned into a base, I will show you how to dye the base and a variety of ribbons (some silk) that can be later used in the embroidery and ribbon worked vignettes. This 2 lesson class is scheduled to begin on March 15, 2011. Your purse or pillow will start with a base of cotton velveteen or silk dupioni fabric. 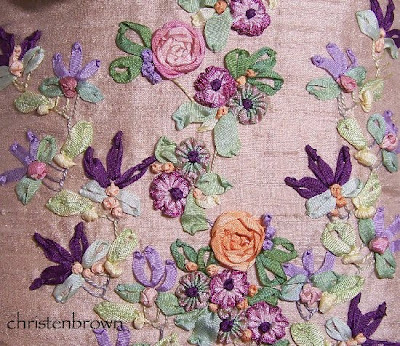 This is embroidered with silk ribbon and silk buttonhole embroidery stitches. A few beads here and there can add a magical glimmer to the design. This 2 lesson class is scheduled to begin on April 1, 2011. This is a technique class that debunks myths, decodes terms and will open your world to the possibilities of COLOR, creating your own colors and dye baths to be exact. The goal of the class will be to record the samples in a journal in addition to the dyed silk swatches that you create in each lesson. We will discuss working with color in different mediums. The class will only use Colorhue dyes; no other dye will be covered. This 3 lesson class is scheduled to begin on April 19, 2011. This 2 lesson class is scheduled to begin on May 17, 2011. I hope that you find something to spark your creative spirit. 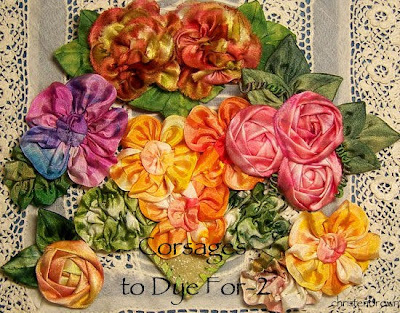 There are three corsage classes where I invite you to take a colorful journey into the realm of dyeing your own RTD (ready to dye) silk ribbons. I will teach you how to prepare your ribbons then dye them to create one of a kind, creative and colorful ribbons. 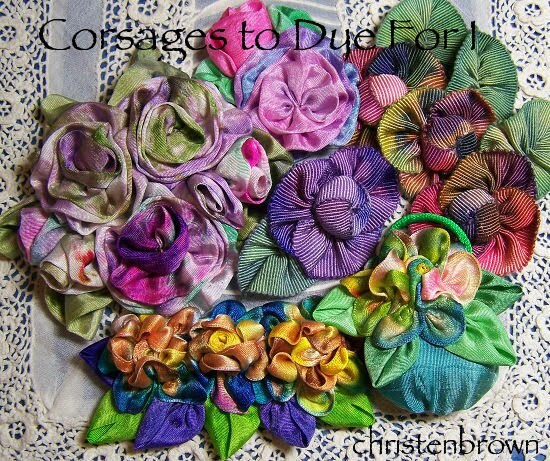 These ribbons will then be turned into magical works of floral art for your own “corsages to dye for”! Corsages to Dye For I: Here we have the the Rose and Bud; Butterflies Delight; and the Harlequin flower. I will show you options on how to use each flower, from a single flower to a group of flowers. 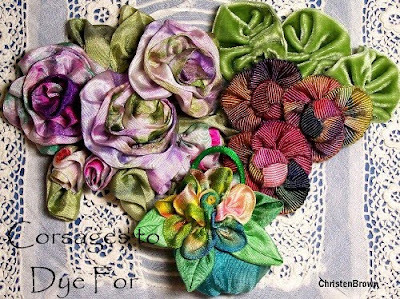 Corsages to Dye For II: Here we have the Chou Rose, the Country Rose, and the Lady Ashley Rose. I will show you design options for each flower, from a single flower to a group of flowers. *New* Corsages to Dye For III: Here we have the Violet, the Sweethearts Flower and the Sunflower and Rosette. I will show you design options for each flower, from a single flower to a group of flowers. *New* Autumn’s Harvest: I absolutely love all of the rich autumn colors: chestnut, golden umber, warm maple, cinnamon and pumpkin. 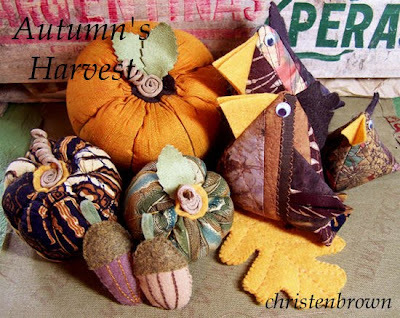 I have put together a few things that will help make your autumn decorations for your home more memorable. These are all soft sculpture items that are made from fabric or felt. 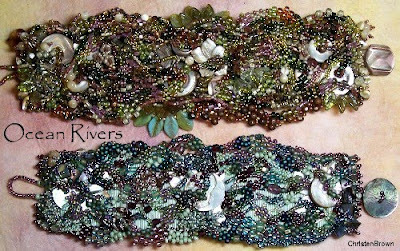 Ocean Rivers: This class will teach you a little bit about the freedom of expression the “free form peyote stitch” can bring to your technical repertoire. This is entirely beaded with seed beads and buttons. *New* Scrumptious Hearts: Bits and pieces of cherished lace are melded with silk fabric to form a beautiful heart shaped base for your floral designed brooch. 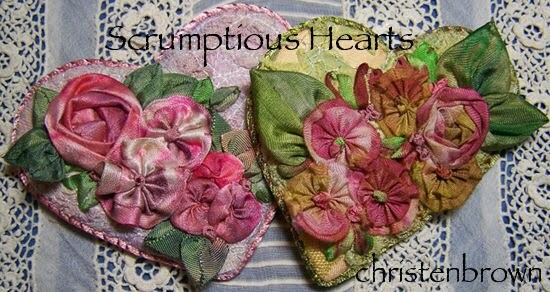 Chose from a few different heart shapes and ribbon worked floral vignettes, or create your own. Joggles offers a wonderful way to learn, with teachers and students from all over the world. I have met and become with friends across the country and have met women from France, Belgium, Australia and Canada. The on-line classes are held once a week and repeat once a week for as long as the class runs. Students receive a link to down load their handout on the first day of the lesson then have the opportunity to ask questions and connect with other students in an on-line forum. I hope that you find something here that you will find interesting! Happy Stitching! Do you find yourself wishing “if only I had a ribbon that was this color or that”, or “why didn’t it come in my favorite colors”? If your answer is YES, then let me invite you to take a colorful journey into the realm of dyeing your own RTD (ready to dye) ribbons. I will teach you how to prepare your ribbons then dye them to create one of a kind, creative and colorful ribbons. These ribbons will then be turned into magical works of floral art for your own “corsages to dye for”! Scrumptious bit and pieces of vintage laces are melded and stitched together to form a unique and beautiful base for your creative stitched designs. Once the lace scraps are turned into a base, I will show you how to dye the base and a variety of ribbons that can be later used in the embroidery and ribbon worked vignettes. 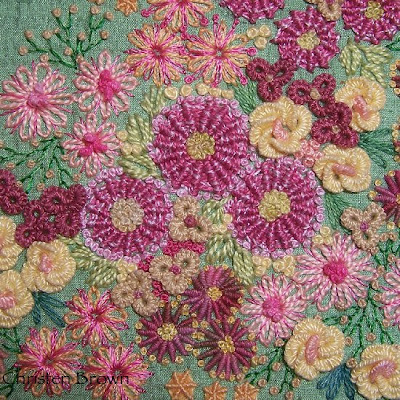 This class delves deeply into the wonderful world of bead embellishment, exploring a wide variety of stitches and embroidery techniques. The sample that you will be stitching on can become a purse (using the pattern provided), a pillow or wall hanging, or whatever you choose. The techniques that will be covered are free-form peyote on fabric, free form bead embroidery, multi bead embroidery, attaching trinkets, buttons and charms with beads, and so much more. Your project will start with a beautiful batik fabric, a variety of seed beads in several sizes and colors combined with a collection of buttons, glass charms and larger beads. 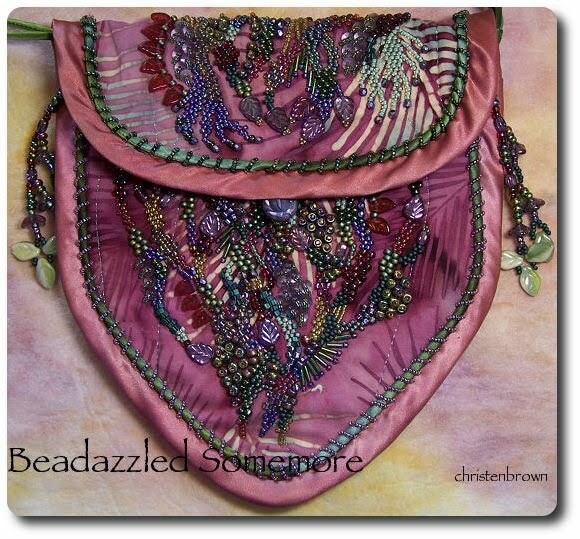 This class is a must for anyone who loves beads! The classes at Joggles are brought to you in a file/document format. The classes can run between three-five lessons, with a week between lessons. Joggles provides an online Forum format where teachers and students can communicate, ask questions, or show off their examples from class. I am a very dedicated teacher, and I want each student to be able to complete the project/s covered in the classes. I prepare each lesson’s document with photographed step-by-step pictures and detailed written instructions. For a more detailed description of each lesson please visit my page at Joggles. We are just wrapping up the Jardin de Grandmere class this week and I still have two more classes left in the Winter Session for Joggles.com. Have you ever wished that you could dye your own ribbon, in the colors that you like the best? 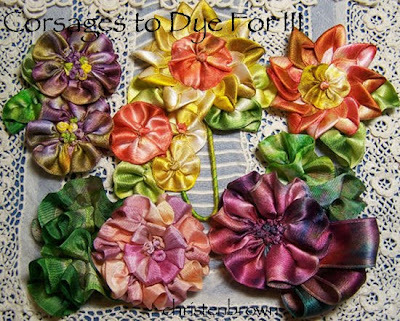 Using simple techniques, I will teach you how to create truly intriguing and colorful patterns with your dyes and ribbon. These ribbons will then be turned into magnificent works of art that you create by stitching petals and leaves for your own “corsages to dye for”! Celluloid was invented in the 1870’s and was one of the first and most versatile of the man-made plastics. Even though celluloid is a thinner material than Bakelite some of the same techniques could be used to create items such as molding, stamping and machine tooling. Both celluloid and Bakelite plastics were used to make buttons, jewelry and other household items such as cutlery, telephones, bathroom essentials and more. Today we will talk about the celluloid button, as you can see in the necklace “Deco Drama”, I really love celluloid buttons! The base of the necklace is a vintage French ombre ribbon, ruched, with a silk cord stitched for the tie. As you can see celluloid was definitely the theme here, using many of my favorite types of celluloid button: molded, tight-tops, French Ivory, glow bubbles, buffed and pierced. Celluloid was a thinner plastic, and detailed shapes could also be created by pulling, hollow blowing, and extruding. The coloring of the celluloid button was often more diverse than that of the autumn and vibrant coloring of the Bakelite buttons. This bracelet is made using vintage glass,celluloid and Bakelite buttons; these are stitched to a base of grosgrain ribbons and an old measuring tape. 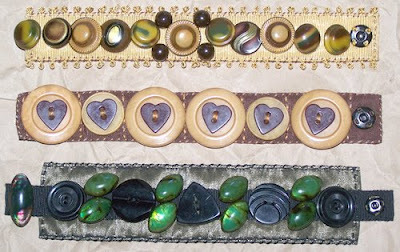 Here are a series of bracelets that feature vintage celluloid, Bakelite and glass buttons. I made these using simple sewing techniques and materials so that the buttons would shine as the stars that they are! The first bracelet base is vintage picot edged grosgrain ribbon. The buttons that I used are celluloid “glow bubbles”, tight-tops and a few brown Bakelite. The second bracelet base is vintage cotton grosgrain ribbon. 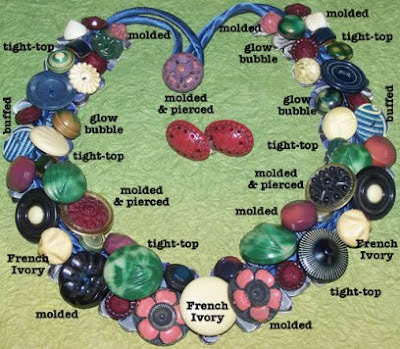 The heart shaped buttons are Bakelite and the cream colored buttons are celluloid. The third bracelet base is taffeta ribbon with a strip of grosgrain ribbon stitched down the center. The incredible green buttons are vintage celluloid “glow bubbles” and the black buttons are carved celluloid. The versatility of celluloid made it extremely popular with button and clothing manufacturer’s, however the serious drawback to this material was that it is flammable! For further reading may I suggest a book I use frequently: Button Button Identification & Price Guide by Peggy Ann Osborne. These buttons should not be stored in a closed glass or metal container because the fumes from the components that create the plastic will smell. Celluloid has a tendency to become brittle, so do not put these buttons in the dryer. If you need to clean celluloid try rubbing with a soft cloth or an old toothbrush to remove debris and to polish the surface. Celluloid buttons can have a variety of shanks such as self and metal; you will find many other plastics have celluloid shanks glued to the button because it was a less expensive material. Labels: celluloid buttons, Jewelry, things that "R GOOD 2 KNOW"
And the winner is: Bluebird and Elizabeth, @ alterbooklover.com Yeah to you! 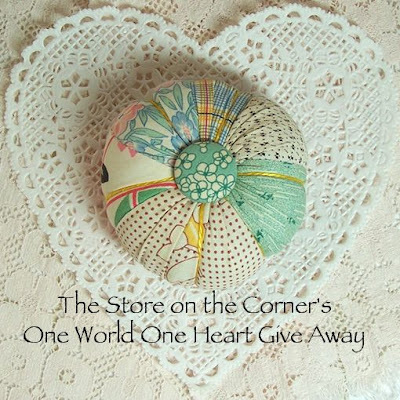 I want to share my profound thanks to Lisa the whimsicalbohemian, for organizing this wonderful event. I enjoyed flying around the airwaves visiting people in far away countries, in my country and even in my own state. Thank you to each and everyone who flew their magic carpet to my doorstep, and each and everyone who left wonderful, encouraging and creative comments! Take care each of you, even though the ride is over, I will still stop by and say hi through the year, and look forward to seeing you next year. PS: I do have a few of these pincushions left in my Etsy store, if you want to take a stop over and see them!